We have become used to the notion of Brexit apocalypse, as the Archbishop of Canterbury observed last year: “They foresee the Four Horsemen of the Book of Revelation (death, hunger, war and conquest), or at the least the UK economy becoming like that of Greece, with massive rises in unemployment, a sharp fall in the value of the pound, consequent high inflation…” As we wait for the sun to be turn to darkness and the moon to blood, the Guardian portends today: “The omens couldn’t be clearer. Chaos and catastrophe will loom as Britain edges closer to a no-deal scenario.” But the shift from Brexit Armageddon to Brexiteer evil is a new departure. Perhaps it was always a logical inference: in the Last Days, the Beast shall rise out of the sea, and Satan shall perform great signs and wonders as will deceive many. But one simply doesn’t expect it to be articulated by an MP in reference to members of her own party. “Now that the forces of darkness have got the prize in sight, they are going for it. I’m afraid that Theresa has embraced these people, they are now running Theresa,” she added. Just to be clear, Anna Soubry is telling the world that the Prime Minister and leader of the Conservative Party is now subject to a gathering of evil; worshipping the devil; under Satan’s rule. 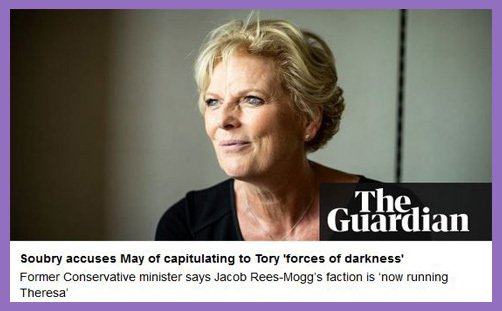 The forces of darkness (led by Brexit-antichrist Jacob Rees-Mogg) must be vanquished by the angels of light (led by God’s messenger Anna Soubry), to whom has been given the keys of the United Kingdom: and whatsoever she binds in Parliament shall be bound in heaven: and whatsoever she looses in Parliament shall be loosed in heaven. And Rees-Mogg and the satanic influence of his coterie of ERG demons who are “running Theresa” must be bound at all costs: Brexit must be stopped by the celestial Remain beings, in whom there is no darkness at all. Soubry is light, sun, fire and bird; Rees-Mogg is darkness, moon, water and snake. He dwells in the dark abyss, inaccessible to reason, insensible to reality. But not all forces of darkness are bad. The ascent to God in contemplation has historically been depicted as an advance into darkness: ‘And the people stood afar off, and Moses drew near unto the thick darkness where God was‘ (Ex 20:21). There is the darkness of gnophos (Heb 12:18) and the darkness of skotos (Mt 4:16): the former serving as a metaphor for the unfathomable transcendence of God and the blindness of the human condition; the latter as moral delinquency or evil. In the darkness of gnophos is the night of the Song of Songs: ‘By night on my bed I sought him whom my soul loveth…‘ (3:1). Moses ascended into a cloud of darkness to receive the light of God’s Commandments; it is a darkness where love is consummated; where the divine nature is revealed. The darkness of our human experience is itself a revelation, an invitation to self-transcendence. In this luminous darkness we become more free to commune with the Holy Spirit and receive true knowledge. I often feel overwhelmed by the scale of this inheritance and by the best accomplishments of my predecessors. Bishop George Bell made Chichester famous for its contribution to learning and the arts, and he was building on solid foundations. In a tenure of just four years, his predecessor, the remarkable Bishop William Otter, established a teacher training college that has joined with another local institution to become the University of Chichester. Otter was inspired by the tradition of learning nurtured by Christian Europe, and from which, even post Brexit, the Church of England will continue to draw. So England shall be enlightened by its church, and the gates of Brexit shall not prevail against it.